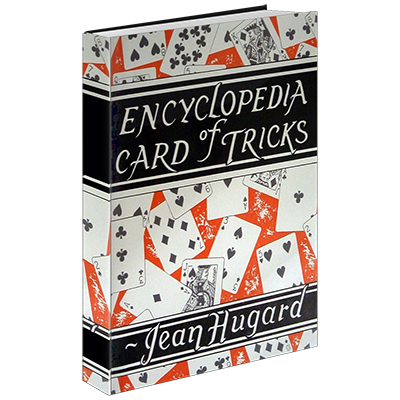 Jean Hugard's Encyclopedia of Card Tricks. An incredibly rich resource for learning card magic. If you only can buy one book on card magic maybe this should be it! Over 400 pages of magic. Includes sections on Impromptu Card Tricks, Spelling Effects, You Do As I Do, Card Subtleties utilizing Key Cards, 'Slick' Principles, Diachylon, Double Back Cards, Double Face Cards, One-way Back Designs, Reversed Cards, Calculation tricks, Prearranged packs of cards, Svengali packs, Mene-Tekel packs, Stripper decks, Special packs, Short Cards, Sleights, the Nikola Card System, and more! Introduced by Ted Annemann, Jean Hugard's ambitious Encyclopedia of Card Tricks is exceptionally important. It contains between its covers nearly every practical card trick produced, invented and improved upon.